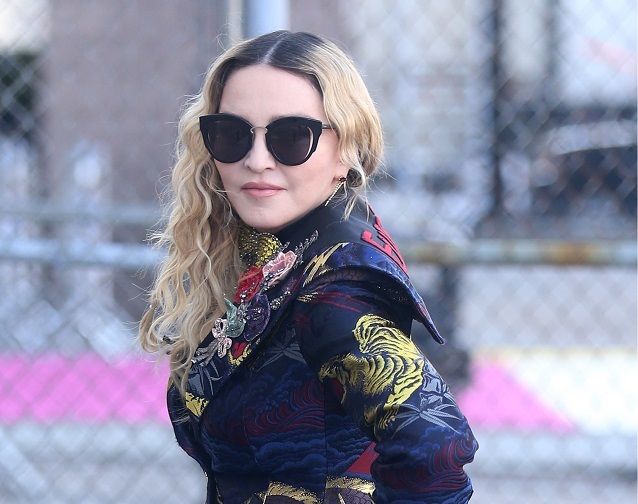 Madonna wears a pair of newest Salvatore Ferragamo black cat-eye sunglasses to the "Billboard Women in Music" in New York recently. This women's sunglasses <SF830S> were the star of the brand's Ad Campaign featuring a cat-eye silhouette with raw-cut lenses. The combination of several acetate elements creates a striking color-block effect, which shows evidence of the collection's fashion influences. The dynamic, intensely individual design is enhanced by the unique metal bridge. Available in black, dark Havana/green, light Havana/red and blue/ivory.